Albania and Croatia have officially joined the Nato military alliance. The two states became Nato's 27th and 28th members after their ambassadors to the US filed their instruments of accession at a ceremony in Washington. Correspondents say Nato wanted to mark its 60th birthday at a summit this week with a symbolic expansion into a region which only a decade ago was at war. Croatia's accession had been threatened by a border dispute with Slovenia, which only withdrew its veto on Monday. Macedonia, another former Yugoslav republic that had also hoped to join Nato this week, has not been able to because of a row over its name with Greece, which has a province of the same name. 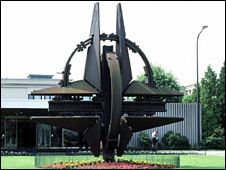 Albania and Croatia's long-expected accession came after all of Nato's member states submitted ratification documents. After Wednesday's ceremony at the US state department, Croatia's ambassador said his country intended to assume its share of the security burden in Afghanistan, where Nato leads the 55,000-strong International Security Assistance Force (Isaf). "We are determined to take our share of responsibility for global peace and stability in places such as Afghanistan but also in other parts of the world," Kolinda Grabar-Kitarovic said. Her Albanian counterpart, Aleksander Sallabanda, said Albania was "ready to take up all the challenges and responsibilities that participation in the alliance entails". "In this context, we will work with responsibility and constructively with our partners to strengthen the... alliance to protect our common values," he added. Both countries will be welcomed into Nato during its 60th anniversary summit in Strasbourg, France, and Kehl, Germany, later this week.